Bhutanese resettled in Adelaide, Australia, celebrated Teej festival for the first time on Saturday with cultural show. Organised by radio programme Yuba Sansar, the function was attended by over 300 female members of the Bhutanese community. Aired through Radio Adelaide, the oldest community radio in South Australia, Yuba Sansar is the weekly show produced by seven Bhutanese youngsters. 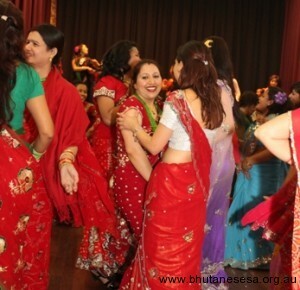 The crowd filled with ladies, adorned by red sarees and gold ornaments, was the clear indication that Nepali culture is an integral part of them in Australia. Young children and youth performed cultural shows including dancing and singing. Senior ladies presented Sangini, an old Nepali folk tune. The group performance by Bikram Adhikari, Jeevan Koirala, Prakash Niroula, Shova Biswa, Niru Mishra and Yuba Sansar radio presenter Lok Poudyel turned the even livelier as they took to floor for dance. Young people were taking the lead in dance floor. Momo and cold drinks were also service during the even as part of the fund raising efforts for the radio program. For more picture visit Stephen Watts Teej Album in Facebook.